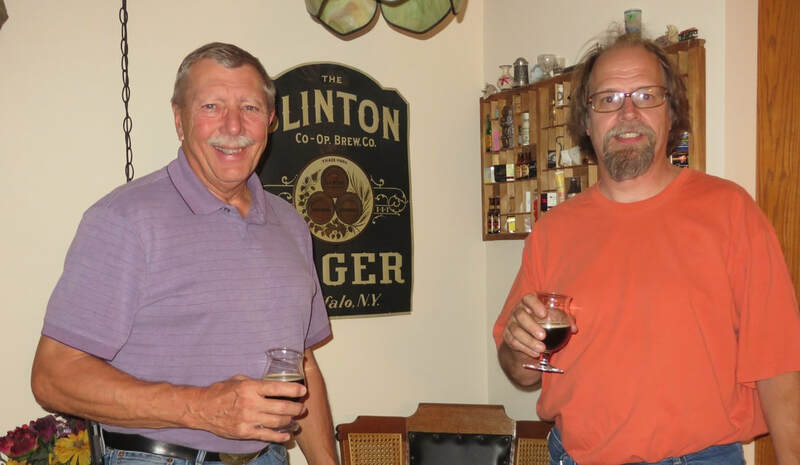 Reviews of micro-breweries, brewpubs and other beer related events on the Niagara Frontier. (2/26/2019) New; Finally our completed ​researched and collated Niagara Frontier Breweries lists are published under the "Niagara Frontier Tab"
​The Complete Buffalo Brewery List updated in the "Buffalo Breweries Tab". Quick Brewing history fact: In 1870 there were 41 Breweries operating in Buffalo and at the beginning of Prohibition there were 18 breweries. This is the only original photograph, known to exist, of the Fox & Williams brewery,. They were located in Buffalo on Morgan and Mohawk Streets. Operating between 1865 and 1875. Thanks to Dave Mik for the Photo. Iroquois Brewery Beer Case. Known as a railroad case because of the lid and inside dividers and used to ship beer around the region. Both of these Buffalo Brewery Pre-Prohibition advertising glasses are very rare. 1947 Add from the Syracuse Post Standard. George F. Stein Brewery operated in Buffalo from the end of prohibition when Stein purchased the old Broadway Brewery at 815 Broadway until it closed in 1958.The brewery building was demolished the following year. The Excelsior Brewing Co. Operated at the corner of Clinton and Pratt (now 458 Eagle St.) from 1887 until 1920. Originally the Kaltenbach Brewing Co. beginning operations in 1977. 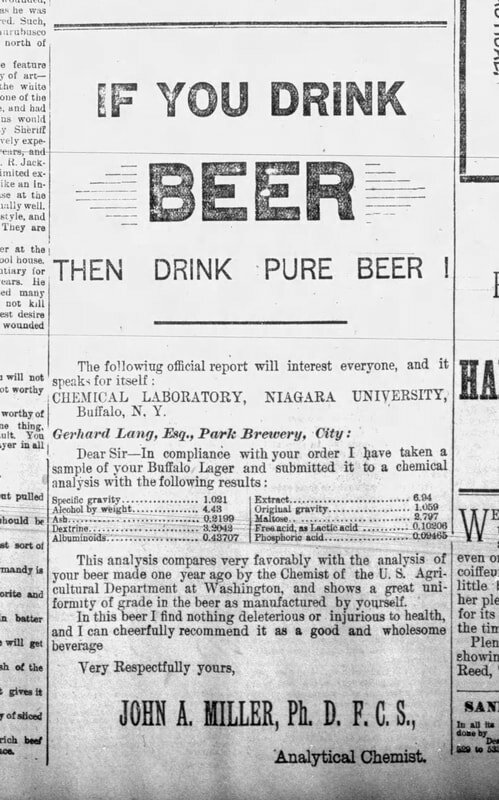 ​This add in the "Buffalo Evening News" on 19 December 1890 was in response to the poor reputation many breweries received from using adjuncts such as rice and corn. 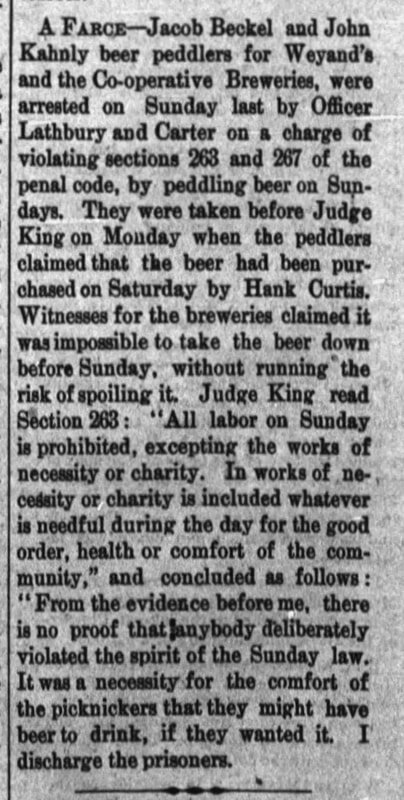 Also the overall safety of some beer was questioned because of bad taste, inadequate carbonation or water added to increase profits. The 1906 "Pure Food & Drug Act" was of a result of the adulteration of beer and many other foods. ​"Haberstro & Schuh" was a Buffalo brewery that only operated for two years 1875 and 1876. In all 10 breweries operated at 20 Broadway from 1855 until 1879. ​Buffalo's "Canal District" rivaled San Francisco's "Barbary Coast" in the 1840's. This report was printed in the "Buffalo Commercial Advertiser" on 28 Sep. 1840. ​Heiser's Brewery add from the New York Almanac of 1867. Dave and I have been researching Buffalo and Niagara Frontier Brewing History for many years. In an effort to make this information available to as many people as possible we have created this web site. Every effort has been made to to be as accurate as possible. We will continue to updating the site on a regular basis. 2015 John Eiss & David Mik. All rights reserved. Viewers are encouraged, for personal or classroom use, to download limited copies of posted material. No material may be copied for commercial purposes. The authors reserve the right to update this information as appropriate.